The Mairiage o Figaro (Italian: Le nozze di Figaro, pronounced [le ˈnɔttse di ˈfiːɡaro]), K. 492, is an opera buffa (comic opera) in fower acts componed in 1786 bi Wolfgang Amadeus Mozart, wi an Italian libretto written bi Lorenzo Da Ponte. It premiered at the Burgtheater in Vienna on 1 Mey 1786. 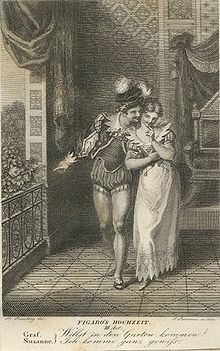 The opera's libretto is based on a stage comedy bi Pierre Beaumarchais, La folle journée, ou le Mariage de Figaro ("The Mad Day, or The Mairiage o Figaro"), which wis first performed in 1784. It tells hou the servants Figaro an Susanna succeed in gettin mairied, foilin the efforts o thair filanderin employer Coont Almaviva tae seduce Susanna an teachin him a lesson in fidelity. This page wis last eeditit on 28 August 2016, at 16:37.